Disney released the first teaser and poster for its live-action version of The Lion King and it is full of glorious nostalgia. The short clip is only about a minute and a half long but it recreates, shot for shot, the opening scene from the animated classic, this time using photoreal animation in the same way that The Jungle Book was made. 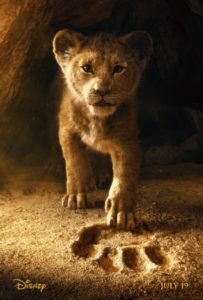 The first poster for the film was also released, showing an adorable lion cub literally walking in the paw-print of his father the king. According to Variety, the teaser set the Disney record for most views in 24 hours with 224.6 million views globally. Across all studios, it’s the second most watched teaser, behind that of Avengers: Infinity War, which tallied 238 million views. The Lion King is just one of the many animated Disney classic films that is being adapted into a live-action version, following the successes of The Jungle Book, Pete’s Dragon, Maleficent, Cinderella, and Alice in Wonderland. More adaptations are currently being developed including a live-action Mulan, and a live-action version of The Little Mermaid. Trailers for Mary Poppins Returns and Aladdin have recently been released. The Lion King stars Donald Glover as Simba, Beyonce Knowles-Carter as Nala, Chiwetel Ejiofor as Scar, Billy Eichner as TImon, Seth Rogen as Pumba, Alfre Woodard as Sarabi, John Kani as Rafiki, and James Earl Jones reprises his role as Mufasa. Pirates of the Caribbean: Dead Men Tell No Tales screenwriter Jeff Nathanson will be penning the script for this upcoming film, and Jon Favreau (who directed the well-received live-action version of The Jungle Book) will be directing. Don’t miss The Lion King when opens in theaters on July 19, 2019.